And that’s how we start a clip show — the first one that Dark Shadows made, and probably the first one in soap opera history. It’s been a few weeks since girl governess Victoria Winters followed her new husband back in time to the 18th century. She figured they could run off and be happy together, apparently forgetting that they were both executed for an assortment of charges, including witchcraft and murder. That’s why they left the 18th century in the first place. So now that they’re gone, Vicki has noticed the down side, and she’s been reaching out to the present day and aggravating everybody. 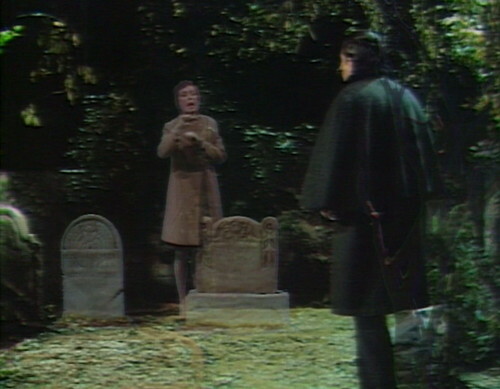 Barnabas has decided to put a stop to this nuisance by visiting Vicki’s grave, and using the secret magic number of the universe to travel back in time, and change history all over again. To kick that process off, today we’ve got a clip show that shows us what happened in the last couple episodes of the 1795 time trip. A clip show is an installment primarily made from reconstituted episode parts, with a little bit of new material around it to explain to the audience why we’re watching disconnected scenes from earlier episodes. TV shows mostly do clip shows because they’ve run out of money, and the producers need to squeeze the budget for one more episode. To make a clip show, you get some characters onto a standing set, and set them to reminiscing. Somebody says, “Well, it hasn’t always been easy keeping up with Arnold,” and then they screenwipe to a scene from a previous season. Clip shows are easy to write, easy to film and easy on the budget. 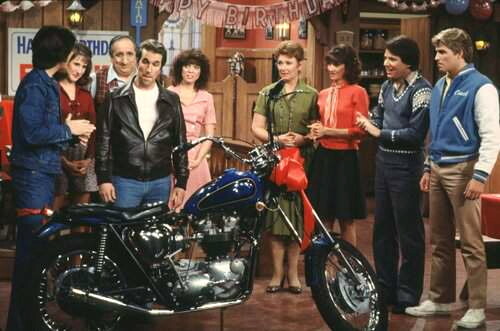 And in the days before DVDs and streaming, they gave the audience a chance to revisit the good old days, before the show was so desperate for money and ideas that they had to make clip shows. 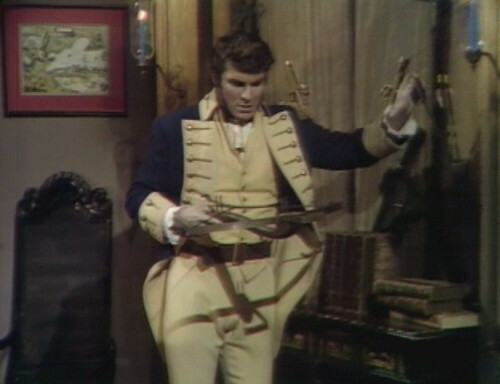 On Dark Shadows, they’re not necessarily trying to save money with this episode; they have bigger concerns. Executive producer Dan Curtis has noticed a little dip in the ratings, which is the real secret magic number of the unierse. Audience numbers have surged from 1967 to 1968, but that’s slowed down, and Dan wants to do something about it. 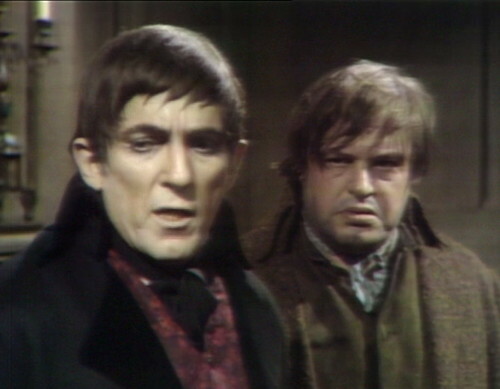 So this week, Barnabas is going to return to the end of the 1795 storyline, to give the fans an extra treat. It’s only been ten months since the episodes that they’re clipping here, but so much has happened in that time that it actually does feel like 170 years ago. 1968 was a year of peculiar choices, and the most peculiar decision of all was to release Barnabas from his vampire curse, just at the point when the housewives and teenagers of America were falling in love with the vampire. All of the promotion and merchandising they’ve done for the show is based on Barnabas the vampire, but just as that publicity blitz was getting underway, they cured Barnabas, and made him human again, apparently forever. Daytime audiences will put up with a lot, but sooner or later, people are going to catch on that this isn’t the show they were promised, and that might be the reason why the numbers are dropping a bit. Giving people a taste of Barnabas vampire action should bring them back, and keep them satisfied while the show figures out what to do next. Returning to an old storyline for a week is a leap of faith, relying on the audience’s capacity to keep track of what’s going on. 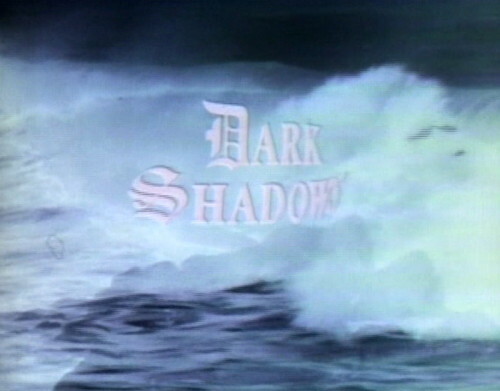 Dark Shadows is unbelievably fast paced now, compared to other soap operas at the time, and jumping from one time period to another just highlights how many story threads the show is expecting the audience to handle. The basic guideline for soaps is that most of the audience can only remember about six months back, so if you’re referencing an old story, you have to spend a lot of time recapping. 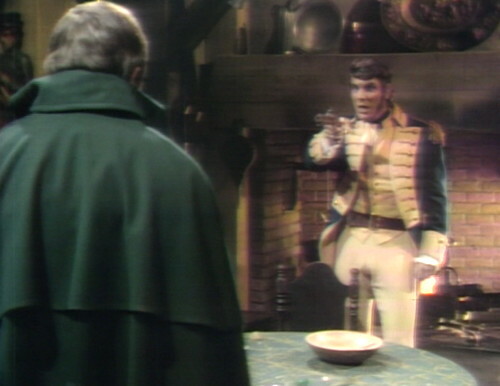 This changing-history week puts even more of a demand on the audience, so Barnabas spends this episode telling Julia the story of what she missed back in April, when she and the family stood around in the drawing room, frozen. Now, you’d think that an episode-long recap show would be easy to throw together, but this is Dark Shadows, where nothing is easy. To start with, they’re making two episodes on the same day. They’re only taping six episodes ahead of broadcast right now, and the holidays have made that even narrower. Christmas and New Year’s both fall on weekdays this year, so they’re losing two days of shooting — but the show is only pre-empted on Christmas, which leaves them an episode behind. So they taped Friday’s episode and today’s on the same day, to save time. 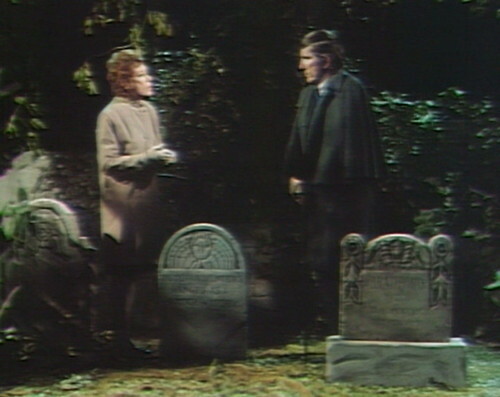 The two framing scenes in today’s episode just use Barnabas and Julia, standing on the set that they ended the last episode with. 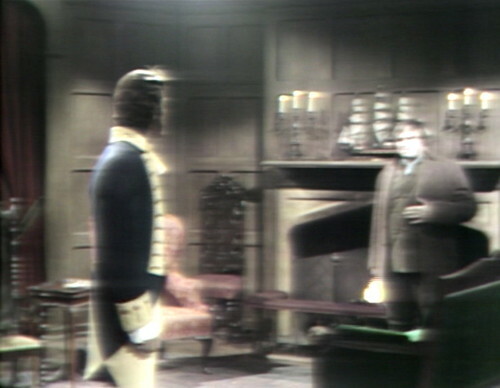 It’s only two scenes, but again, Dark Shadows, so the second scene includes a lengthy Barnabas monologue and a Chromakey effect. But once they’ve taped that sequence, it’s smooth sailing, right? The rest is just a matter of slapping a few clips together, adding some voiceover narration, and calling it a day. Except that editing clips is a really hard job for 1969 Dark Shadows. Back then, editing videotape was expensive and difficult, and involved literally cutting up footage with X-Acto knives and putting it back together with tape. Plus, the editing machine is thirteen blocks away, at the WABC/Channel 7 studio, where they have to wait for the news people to finish with the equipment. That’s why they film Dark Shadows as live-to-tape, just a single thirty-minute take, leaving empty space for the commercials. Lately, they’ve been doing an occasional edit if there’s a special effect they really want to do, but it’s usually just one cut, planned around the effect. Today, they have to splice together nine different scenes, adding some voiceover from Barnabas on top. It turns out that’s not as easy as you’d think. So there are some obvious artifacts of the editing process in today’s episode. For one thing, it doesn’t include the opening theme. They end the teaser with Barnabas talking to Ben, and then go straight to the commercial break, without showing the opening titles. Also, the scenes look awful. The clips at the beginning and the end of the episode are all right, like they were made from second-generation copies of the tape. The middle section is terrible. The recap is telling the story of Barnabas coming to kill Nathan, who he blames for causing his mother’s death. Nathan grabs a crossbow off the wall, and fires a bolt into Barnabas’ chest, but he misses the vampire’s heart, and everybody lives happily ever after. And look at that screenshot above. They must have been using a fourth-generation copy. It’s fuzzy, and the color is washed out, especially on patches of white and yellow. Unfortunately, most of the scenes are about Nathan, who’s entirely dressed in yellow. It’s really bad. I’m surprised this was considered broadcast standard. Once again, Dark Shadows gets a pass, because it’s a daytime show and nobody cares. They’d never show this in prime-time, even in 1969. And then they play the opening titles, which they’d skipped earlier. My theory is that they actually forgot the opening as they were editing the tape. They realized their mistake after they were done, so they just spliced the opening into the end of the show, and called it a day. That’s how primitive this production is — the clip show is actually harder to produce than a real episode. The new scenes that they film today are fine, but the clips are a mess. These days, in an age when eight year olds can edit video seamlessly on the family computer, just thinking about how this episode was made counts as time travel. Just look at what they had to go through, just to not film an episode. 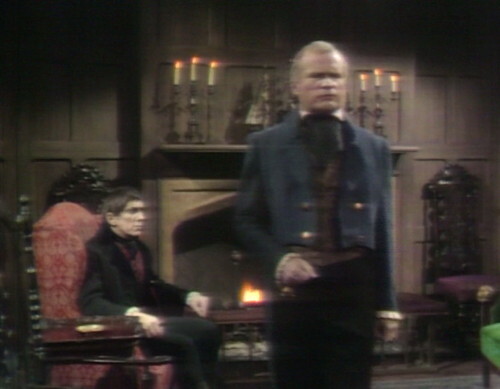 For the cast and crew, Dark Shadows is just live theater with cameras. They know how to do that. But a clip show is television, and as it turns out, television is really, really hard. Tomorrow: This Is the Night. 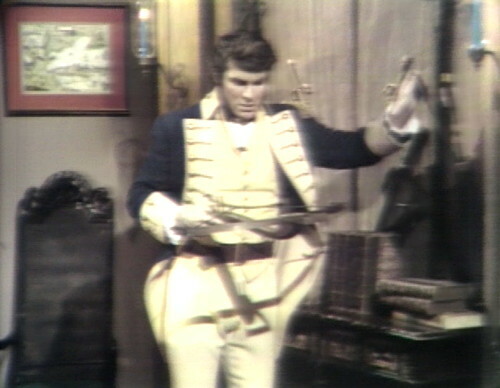 In the final scene, Julia rescues Barnabas from a flubbed line. Julia: And what if that night doesn’t go the way you want it to go? Julia: But you won’t have any more control than any of the others involved. 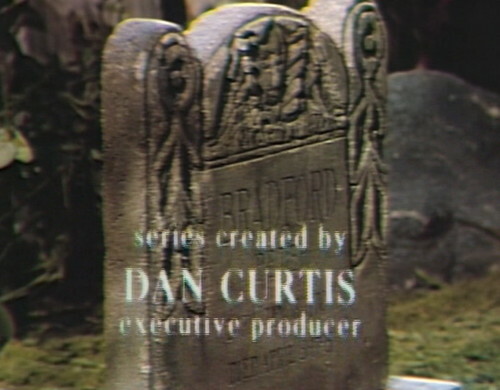 The closing credits say that the episode was written by Sam Hall and Gordon Russell, but the clips were from episodes written by Ron Sproat. The story of Barnabas and Angelique was another ratings grabber, so this would explain Lara Parker’s intermittent appearances over various storylines, rather than as a regular player portraying other characters as had been done by other cast members. 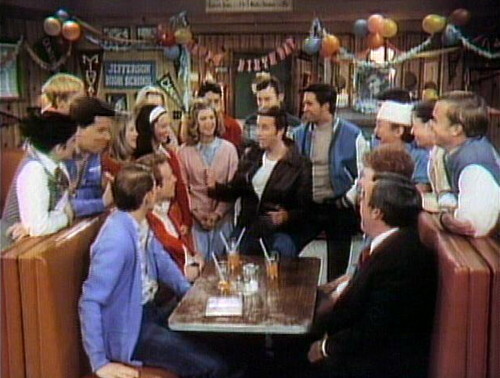 And hey, what’s Murray the Cop doing in a Happy Days episode? Murray the Cop time traveled between 1950s Milwaukee and 1970s New York. He went ‘undercover’ in the Midwest. And poor Jonathan Frid is skipped in the credits … this episode really is a mess!!!!! Episode 938 contains clips from from 884 and possibly 886. It’s less a recap episode so much as course correction for the Leviathan storyline. Although, this return to 1795 could also be considered course correction. 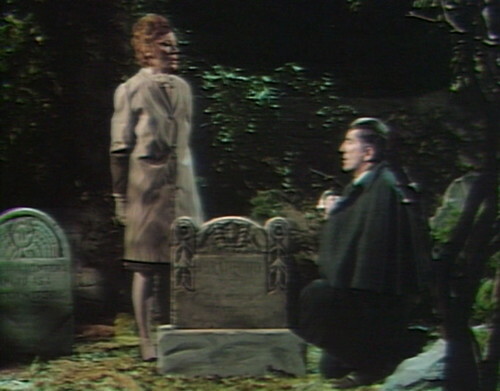 We see a far more interesting Barnabas, and in many ways, this episode is a good example of the Barnabas Collins the housewives loved — he’s driven to kill a man in cold blood but because he’s grief stricken over the death of his mother. He also shows compassion and friendship for Ben, and the chemistry between Frid and Edmonds as son and father is amazing. Like Quentin and the 1897 Collins family, Barnabas has a connection to ththe 1795 Collins that isn’t matched in 1969, where he does just seem to come across as the butler or kindly uncle. This episode also demonstrates the advantage of time travel — characters we like and enjoy can die! Even those played by Joan Bennet! It is a brief example of the fun that can be had in 1897. Barnabas will also kill a person trying to do things to Julia now. I think this is where Barnabas starts to becomes almost like a super hero, with his special powers and being on a mission to help people. It really sets the tone for rest of the run. I wouldn’t be surprised if the letters the show received after this coming week aired were like “you should just keep the whole show in the past” and stuff like that. Also, I know you’ve discussed it before, but it’s interesting, Barnabas’ memory is now of Victoria and not Phyllis Wick. I’ve always imagined the timeline must’ve changed when Eve went back to 1796, she went back to the Vicky in 1796 Timeline and that’s the one she returned to in 1968. You know what’s crazy? I didn’t even notice that. You’re right, he just starts talking about Vicki getting hanged. I can’t believe I didn’t realize that, since I just wrote a super long and super crazy post where I claimed that Vicki was Phyllis and vice versa. Every once in a while, those crafty DS writers slip something right under my radar. Today’s post made me wonder. Would casual or new live viewers actually realize Barnabas is NOT a vampire? This is one area where their thematic error in not making us care if Barnabas is a vampire or not by having them act exactly the same would be a benefit. I mean they’ve been told that the show is about a vampire named Barnabas and here is this character named Barnabas who never goes out in sunlight, who is self-centered and does crazy things like try to bring dead bodies to life, who has a dark and sallow complexion [see bit about never going out in the sun 🙂 ], wears a dark swoopy cloak type coat, and a big old black ring on his hand. You don’t see him feasting on anybody or fangs, but if they are like canines they could be there and you just can’t see them. So how would a casual viewer know that Barnabas isn’t a vampire? Although I am watching at a different pace than original viewers, I’m similarly pleased to have a clip show. How could I forget that crossbow? As a DS viewer it’s easy enough. But it was also instructive to return to Nathan Forbes’s final days. As the writers painted themselves into the 1795 corner, Forbes went from a charming rogue to a cartoon villain, and that always seemed to unfair to Joel Crothers, who was such a charasmatic performer. And he we are nearly 200 years later giving the character of Joe a similarly reductive ending. Crothers was a pro to the end, but they do him dirty no matter where in time he was. I don’t blame him for getting out before they could find some similar mistreatment in the late 19th century.